Green Grass handmade soap is like rain on freshly cut grass. 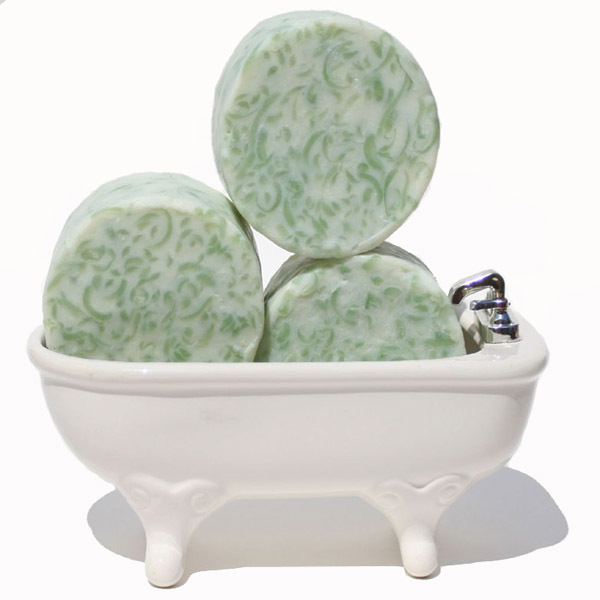 The scent in this green and white round soap will bloom in your bath or shower. When you use Green Grass handcrafted soap, you will think of gently falling rain on freshly cut grass. The fragrance is definitely green with a crisp clean note of the great outdoors in the spring. I made this batch with shredded soap and added the green shreds to white round soap, so it looks like grass. This soap is beneficial for all skin types; whether oily, dry, mature, acne prone or T-zone skin. Green Grass soap is gentle and mild. I use food grade oils to make my soaps with. They include olive oil, coconut and castor oil. Each soap batch has been enriched with mango butter. Green Grass handcrafted soap is hand cut and aged for at least six weeks. The color, weight and size might vary lightly. All my handmade soaps are packaged in a soap box to protect it until it gets to you. Green Grass Handmade Soap is fresh, clean and vibrant. With just a hint of sweetness, it's crisp, sweet and green just like grass after a gentle rain. This scent will bloom in your bath or shower! Ingr: Olive oil, Coconut, Palm Kernel, Mango Butter, Castor oil, Soybean, Sodium Hydroxide, Beeswax, Fragrance, Sodium Lactate, Green Oxide, Green Clay from the Coso Mountain region in California.